Not pressing on a nerve, you may have an ache in the low back or no symptoms at all. Pressing on a nerve, you may have pain, numbness, or weakness in the area of your body to which the nerve travels. With herniation in the lower (lumbar) back, sciatica may develop. Sciatica is pain that travels through the buttocks and down a leg to the ankle or foot because of pressure on the sciatic nerve. Low back pain may accompany the leg pain. With herniation in the upper part of the lumbar spine, near the ends of the lowest ribs, you may have pain in the front of the thigh. With herniation in the neck (cervical spine), you may have pain or numbness in the shoulders, arms, or chest. Usually occurs in only one leg. May start suddenly or gradually. May be constant or may come and go (intermittent). May get worse ("shooting pain") when sneezing, coughing, or straining to pass stools. May be aggravated by sitting, prolonged standing, and bending or twisting movements. May be relieved by walking, lying down, and other positions that relax the spine and decrease pressure on the damaged disc. Weakness in both legs and the loss of bladder and/or bowel control, which are symptoms of a specific and severe type of nerve root compression called cauda equina syndrome. This is a rare but serious problem, and a person with these symptoms should see a doctor immediately. Other symptoms of a herniated disc include severe deep muscle pain and muscle spasms. If you suffer with any of these symptoms consider visiting my NYC medical office. 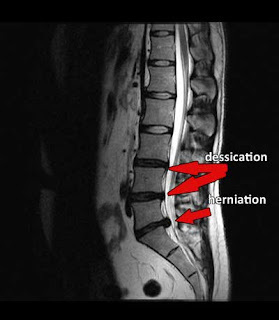 I will review any MRI's and determine if you are a candidate for non-surgical spinal decompression.